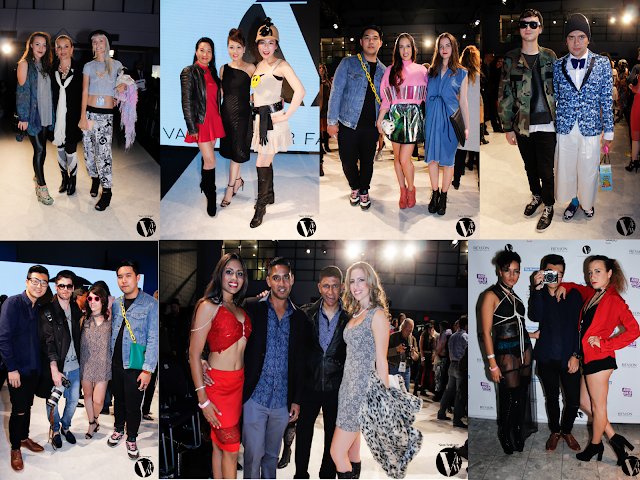 Day 1 of runway shows at Vancouver Fashion Week was, of course, exciting. I loved looking around and seeing all the unknown faces, and yet when the evening's emcee - Symone Says - asked who had attended a previous season, most raised their hands. It's always a good sign when the majority in the audience are returning guests. That's how you build success. But it's also wonderful to see so many new faces ready to experience their first season. For S/S 16, I decided to change my coverage. With 113 designers scheduled to show collections, what I had done in the past just did not seem sufficient. I will be putting all local designers in an separate article - all in one location - to encourage people to shop local. 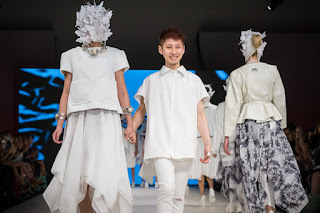 As I adore promoting new talent, there will be a separate articles on Lasalle College and VCC student shows which I will feature in Metro Living Zine. Then there will be the traditional highlight of 3-4 shows each day, but this time the highlights will feature only talent from outside the Vancouver lower mainland. My main photo today is very special to me. The woman I am with is Dale of Pizzazz International. Many years ago she stepped in to coach my daughter when she first started modelling. It was such a surprise so see her here across the runway as it's been a few years. My outfit today featured jewelry from Ten Thousand Villages, top by RV Designs, skirt by Shelley Klassen of Blushing Designs and shoes from Aldo. Before I begin on day one highlights, I would like to give a nod to the opening gala held on Monday. As I sit through all shows each day, I often choose to give this a pass to save my energy. Everyone I spoke with enthused on how great the evening was, so I want to offer everyone a taste. Here is a great highlights video shot by my dear friend and uber talented photographer Peter Jensen! Below are just a few from the international collections showcased this day. All were wonderful, so be sure and check out the other designers. Because of the extended coverage I am doing this season, I can only offer a sound byte on each designer. Please visit their websites for more information. Zorana Janjic is a newly established, Paris based fashion house (founded in 2014) dedicated to the creation of innovative and unique fashion/lifestyle products. The designer pairs traditional craftsmanship with contemporary designing, with emphasis on tailoring and the use of custom developed fabrics. Each garment is created by teams of France based artisans with extraordinary craftsmanship skills, who strive to push the boundaries of technique and design with each new collection. As someone who has sewn all my life - both personally and professionally - I was intrigued by the detail work in this collection. Each garment had intricate, hand crafted detailing that was very labour intensive. Kudos to the designer. In this day of mass production at the cheapest cost, it was fabulous to see real craftsmanship incorporated. I never cover swimwear - ever. I just don't find it lends itself well to the runway. Well - that was until now. Kudos to all involved in this show which kept my attention from start to finish! The collection had unusual print choices, the shapes varied from traditional, to wearable, to cover-ups. The music was fab and the models literally danced down the runway in their enthusiasm. What more could you ask for? Maaji is a Columbian brand. Strongly influenced by their family’s entrepreneurship and commitment to contribute to the social development of their country, sisters Manuela and Amalia Sierra began pursuing their dream of creating a brand that would enchant. Each Maaji print (what I think is one of the strengths of this brand) is developed in house. They use a flattering and fascinating technique that gives just the right amount of support without leaving marks or indentations on the skin. The seams and stitching mysteriously disappear thanks to their expert manufacturers. I was fortunate to receive a bit of pre-press on designer Matt Hui and his knitwear, Hui's brand exudes luxury and femininity, with a hint of edge and carelessness. Effortless Chic. The designer honed his skills during internships with Pringle of Scotland in London, Shanghai Tang and Johanna Ho. In 2014, Hui established his own brand focusing on bold, clean lines and materials with high quality, comfort, style and elegance. I liked the clean lines and looser fit of this collection. The garments looked easy and comfortable to wear, yet very stylish. I will be keeping my eye on this designer. I walked in early to the new season of VFW only to find Viviano Sue rehearsing his models on the runway. SOLD! When you watch tons of runway, it's nice to be surprised. The collection was edgy and the presentation unusual - I couldn't have asked for more. 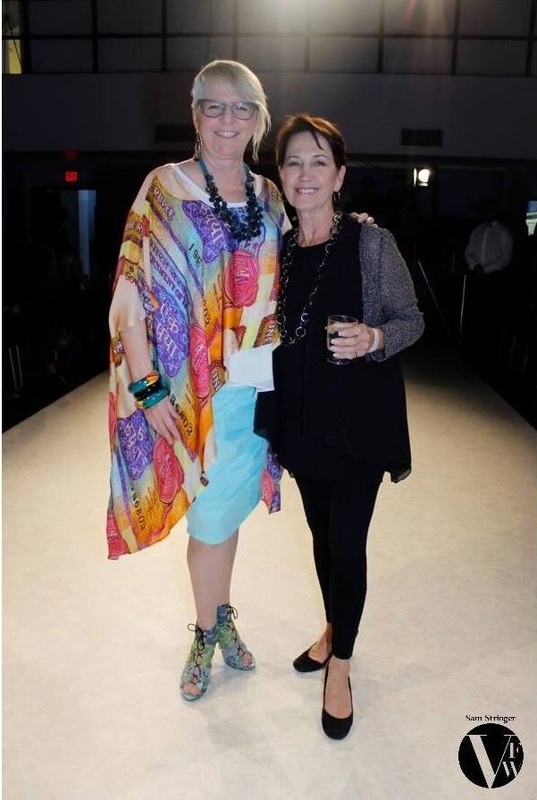 Sue is an Avant-Garde designer, passionate about pushing the boundaries of fashion. He has lived in the US and China and studied in Japan at Bunka Academy in Tokyo. These diverse cultures have influenced his aesthetic as a designer. His inspirations are drawn from structures in architecture, geometry and nature. With a MA behind him, Viviano has now built his own brand and is now read to take this to the new stage. 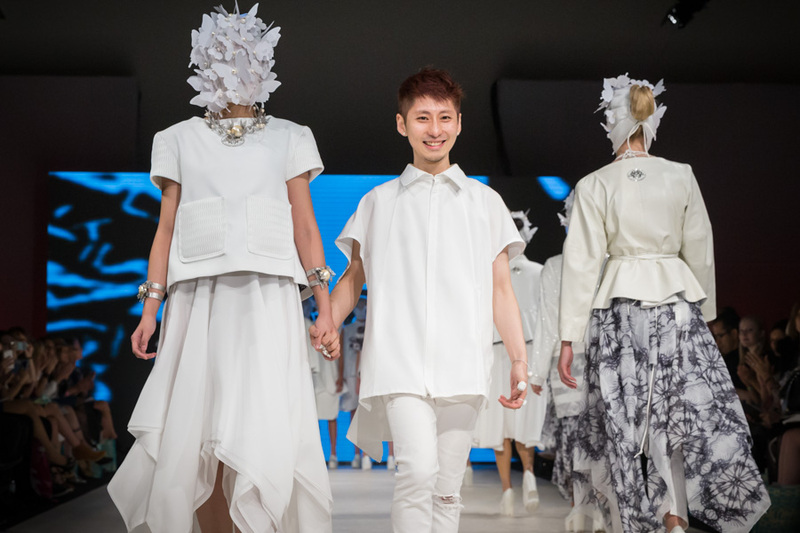 His debut show on the runway this night was titled, “No-Gender." It's a ready-to wear line of edgy garments. 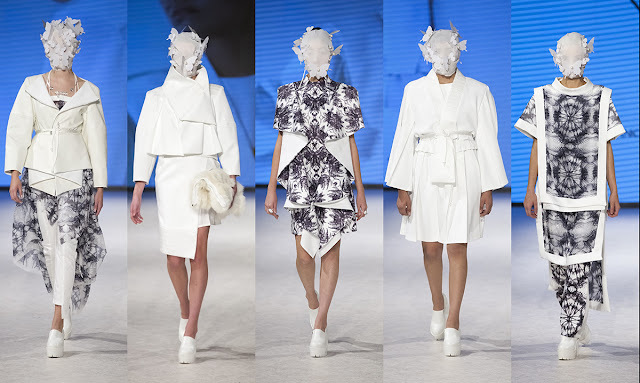 I loved the geometry, the white/black palette and the faceless models. The theme was transformation, so each model had a knit head covering adorned with butterflies obscuring their face. Kudos on a great collection overall and on an unusual presentation that kept the audience on the edge of their seats after a long day of shows.